It’s hard to believe that it’s over. After a year of saving, planning and waiting, the big day finally came. Penned Con 2014 was more than I hoped for and more than I could have even imagined. Highlights include meeting friends who I have been conversing with online for the past 12 months or more in person with the warmest of hugs. 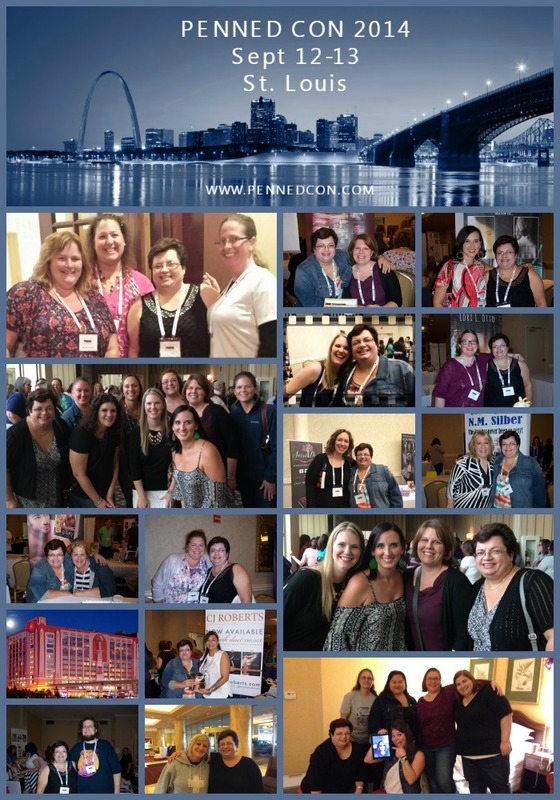 Meeting my blog team Stephanie Marshall, Pamela Embeler, Penny Scott, TK Rapp, Kim Stedronsky, Jenn Beach, Lori Otto and so many others only added to the joy that I experienced at Penned Con. The opportunity to spend three days with people I love, who just so happen to share an mutual interest was incredible. The sounds and squees of fangirling and fanguying was constant throughout the entire event. So, who are all these people in the pics you ask? Starting in the upper left is: My blog team Steph, Pam and Penny. Moving right is Kim Stedronsky, TK Rapp, Jenn Beach, Lori Otto, Penny Reid and Nadine Silber. In the lower right are: A group picture of Jenn Beach, TK Rapp, Kim Stedronsky and myself. Under that is a group pic from Lori Otto’s birthday party including Jo Stevens, Lori Otto, Casey Corn and Lori’s assistants. Moving back to the left is Sarah J Pepper, Eric Asher, CJ Roberts, Amalie SIlver and LU Ann. Just above that is me with Darci, Jenh, TK, Sue, Kim, Amber, Kari and Shannon. Thanks to Rick and Amy Miles for hosting such an amazing event. It has been fun looking at all the pictures everyone has posted and remembering moments here and there. Posted in Penny Lisa, PFMTBB News. Bookmark the permalink.